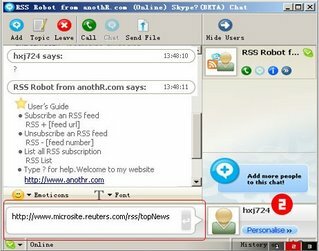 Anothr is a Skype based robot which can provides just-in-time alerts for your favorite feeds. It can simplify your blogs/news reading experience and improve the effectiveness of your daily information flow. Just need to do is add Anothr.com to your Skype buddy list. Easy & useful. Actually, Anothr is a Chinese website but it has English version.